PRODUCT: 12-1/4" DIA. 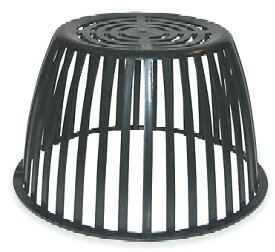 BASE X 7-1/4" HIGH, REPLACEMENT BLACK DRAIN DOME / STRAINER/ GRATE. UV RESISTANT POLYETHYLENE. BASE FLANGE IS .430" WIDE x .185" THICK. REPLACES POPULAR B2-DM DRAIN STRAINERS / DOMES. PRICE/EACH. APPLICATIONS: REPLACES 12" PLASTIC TWIST-LOCK STRAINERS ON MOST POPULAR ROOF DRAINS. FITS WATTS B2 DM. Fits Watts RD-100, RD300 series drains and others.